In the heart of central Vermont, far from crowds, traffic and noise, is an exceptional bed and breakfast where one can unwind and enjoy an unhurried pace of life. Set amongst hills and old country roads, the Inn at Clearwater Pond offers simplicity and understated elegance. Surrounded by seven magnificent acres of open meadows and lush green rolling hills, the inn is located in the picturesque town of Quechee, near Woodstock, Vermont. The property backs up to the Quechee Gorge and the famous Simon Pearce Restaurant and Glass-blowing is about 1 mile away. A little further down the road from this elegant country property lays the quaint village of Woodstock, which year after year is voted "the prettiest small town in America". Located in one of the most sought-after travel destinations in New England, this bed and breakfast inn provides superb service and hospitality to the discerning traveler. PET POLICY - Would you like to bring along your furry companion? Yes, we are pet friendly; dogs, birds, fish, reptiles.......just no cats, unfortunately. BUT, you must contact us first as only certain rooms are pet-friendly - 802-295-0606. And a couple of things you should know ahead of time. 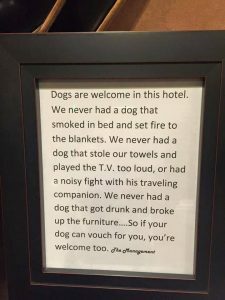 We do not allow any pet to lay or sleep on our beds or furniture. You must bring bedding for your pet. We do not allow pets to be left unattended. There is a "doggy-day-care" farm directly across our road where you could leave your pet while you are away from the Inn. Pet must be leashed when walking through the Inn. We do have a dog (Sam) who resides with us and he is very friendly. You are welcome to let your pet run in the backyard or swim in the pond. We require all pet owners to sign a Pet Agreement. Due to the additional cost and time it takes to clean a room after a pet has checked out, our rates remain standard. Please do not book one of our rooms unless you have spoken with us directly - 802-295-0606 - Thank you! GETTING HERE - FLYING IN? Best bet is Manchester, New Hampshire. Second choice Burlington, Vermont. Third choice is Hartford, Connecticut (Bradley). Boston, Massachusetts is our last choice due to heavy traffic entering and exiting the city. If you choose to fly in or out of Boston, try to arrive or depart early/mid-afternoon or late night. Driving time from all 4 airports; Manchester - 1 hour 20 minutes and no traffic. Burlington - 1 hour 15 minutes and no traffic. Hartford - 2 hours 20 minutes and no traffic. Boston - 2 hours 20 minutes and always heavy traffic and accidents - plan on 4+ hours. DRIVING? We are located 4-1/2 hours from New York City, 3 hours from New Haven, CT., 2 hours from Boston, MA or 4 +/- hours with heavy traffic, 3 hours from Montreal, 2-3/4 hours from Portland, ME, 2-3/4 hours from Albany, NY, 8 hours from Washington, DC. TRAVELLING BY TRAIN? The closest Amtrack station is in White River Junction, VT and is 10 minutes away. We also recommend stations in Rutland, VT and Burlington, VT.
Our country inn is also perfect for every kind of gathering, family events, celebrations and reunions. Our guests are VIP's and we are here to accommodate your whims and desires. We will be pleased to help you plan your visit, answer questions about sightseeing around New England and recommend local restaurants and specialty shops. Service, hospitality, genuine warmth – it’s what we know how to do. It’s what we like to do, all day and all night.